Discuss with the laboratory technician the type of bar/special abutment planned and the relevant retentive elements. Use a custom-made rigid impression tray with occlusal screw access holes following an open tray impression protocol. Syringe an elastomeric impression material around the impression copings intra-orally and take an impression. After complete setting of the impression material unscrew the impression coping screws and remove the impression tray. Inspect the impression for discrepancies and send it to the laboratory. A model and a wax-rim for inter-occlusal records are fabricated. The wax-rim is sent to the clinician. Use the wax-rims and a face-bow for establishing jaw-relation records. diagnostic tooth set-up is made. Try-in the diagnostic tooth set-up to verify functional and esthetic parameters. 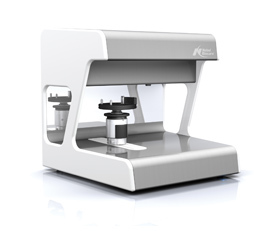 The dies and model are scanned using the NobelProcera Scanner. The data is transferred via the Internet to a NobelProcera production facility. The bar is milled from a homogenous titanium block for high strength, polished and returned to the dental laboratory (with attachments, if ordered through NobelProcera System). The bar is sent to the clinician. 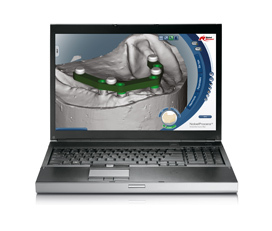 Check precision of fit of delivered Implant Bar Overdenture intra-orally. A passive and precise fit is essential. A forced fit can result in stress concentration on one or more implants, potentially leading to implant failure. An overdenture is fabricated or an existing denture is modified according to standard protocols. If applicable, the housings of the selected retentive elements are integrated in the overdenture. Ensure that the implants are free of any soft tissue or bone remnants. Connect the bar to the implants with abutment screws using the Screwdriver Unigrip. Starting with the implant nearest to the middle of the bar, tighten the remaining screws, alternating left and right sides. Tighten the abutment screws to 35 Ncm using the Manual Torque Wrench Prosthetic and Screwdriver Machine Unigrip. A radiograph can help confi rm accurate seating of the restoration. Only Nobel Biocare provided screws should be used with the Implant Bar Overdenture. Connect the bar to the abutments with prosthetic screws. Starting with the implants nearest to the middle of the bar, tighten the remaining screws, alternating left and right sides. 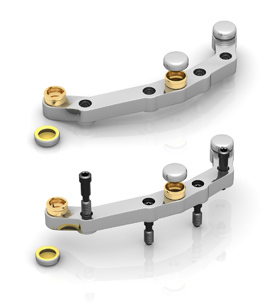 Tighten the prosthetic screws to 15 Ncm using the Manual Torque Wrench Prosthetic and Screwdriver Machine Unigrip. Only screws provided by Nobel Biocare should be used with the Implant Bar Overdenture.